With the Peg Perego Silver Polaris Sportsman 850 Ride On, your child will have a sweet ride of their own to enjoy! Take outdoor playtime to the next level. Now your little one will have a new way to get around the park, backyard or almost any terrain. 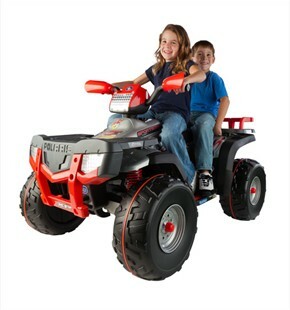 The large traction wheels with red line traction bands are designed to function like real ATV vehicles, so your child can ride over dirt, grass or hard ground. This battery operated ride on features a super power 24 volt rechargeable battery. The charger is included, too, so the ride just keeps going! Your little one can ride in safe yet fun speeds up to 3.5 to 7 mph. Designed for children ages 5 to 10 years old. This realistic kids vehicle comes with a Smart Pedal variable speed accelerator for extra riding time and control, so your little one will have the smoothest ride on the block. Accessories include front and rear luggage racks, a switch to reverse easily like a real car and a flip-up backrest, so their friend can join them on their adventure. Now your little one can conquer the neighborhood streets, local trails and soon enough, the world, as they ride in this durable battery powered ATV!